THP 1-13-012 HUM (CR 2500 13 THP) Green Diamond Resource Company, 108 acres; 71% clearcut, 19% selection, 10% no-harvest logging. Maple Creek (HUM: T8N R1E Sec.16, 24, 25; T8N R2E Sec.19,30). Wet weather operations, high erosion hazard, steep slopes up to 70%, oversized unit b, coho watershed, herbicides, 8 spotted owls within 1.3mi, osprey sightings nearby, marbled murrelet habitat within 2.8 mi, trees over 32" dbh. Estimated public comment deadline: 04/01/13. This THP is about 7 miles NE of the town of McKinleyville, and a few miles south of Redwood National Park. Green Diamond Resource Company owns over 99.5% of plan area which has no access to the public, and a long history of intensive logging. 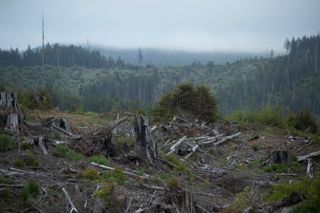 They are planning a mostly clearcut logging operation of second growth 70 year old trees using feller bunchers, shovel & cable logging. At an elevation of 40 - 2,300 feet, Maple Creek Watershed is an important coastal cutthroat and steelhead fishery which flows into the Pacific Ocean 4 - 6 miles away. The THP also includes a special protection zone around an old railroad trestle in unit a. More information is available on the THP Tracking Center website.